Spinocerebellar ataxia type 1 is late-onset neurodegenerative diseases caused by the expansion of a CAG triplet repeat in the SCA1 gene. This results in the lengthening of a polyglutamine tract in the gene product ataxin-1 producing a toxic gain of function that results in neuronal death. 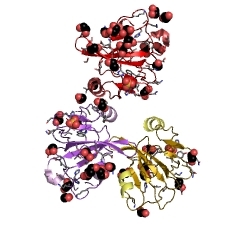 The crystal structure of the AXH domain of ataxin-1 has been determined as it exhibits significant sequence similarity to the transcription factor HBP1 [(PUBMED:12965213)] and has been implicated in RNA binding and self-association. 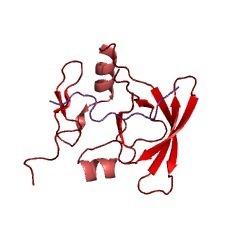 The AXH domain is dimeric and contains an OB-fold, a structural motif found in many oligonucleotide-binding proteins. 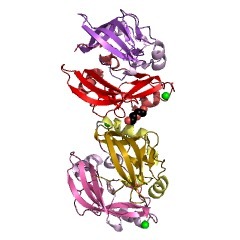 By comparison to other proteins that contain an OB-fold, the putative RNA-binding region has been identified. In addition, there are a number of well-conserved residues that form a second ligand-binding surface, suggesting that AXH domains interact with a common yet unidentified partner [(PUBMED:14583607)]. 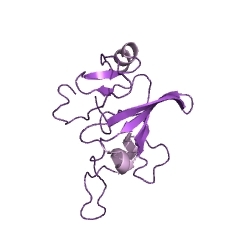 There are 247 AXH domains in 247 proteins in SMART's nrdb database. Taxonomic distribution of proteins containing AXH domain. This tree includes only several representative species. The complete taxonomic breakdown of all proteins with AXH domain is also avaliable. Click on the protein counts, or double click on taxonomic names to display all proteins containing AXH domain in the selected taxonomic class. 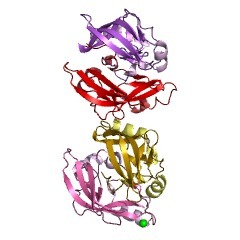 Identification of a self-association region within the SCA1 gene product, ataxin-1. 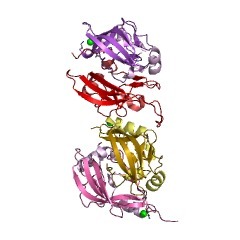 Spinocerebellar ataxia type 1 (SCA1) is an autosomal dominant neurodegenerative disorder caused by the expansion of a polyglutamine tract within the SCA1 gene product, ataxin-1. Expansion of this tract is believed to result in a gain of function by the mutant protein, perhaps through altered self-associations or interactions with other cellular proteins. We have used the yeast two hybrid system to determine if ataxin-1 is capable of multimerization. This analysis revealed that ataxin-1 does have the ability to self-associate, however, this association does not appear to be influenced by expansion of the polyglutamine tract. Consistent with this finding, deletion analysis excluded the involvement of the polyglutamine tract in ataxin-1 self-association, and instead localized the multimerization region to amino acids 495-605 of the wild type protein. These results, while identifying an ataxin-1 self-interaction region, fail to support a proposed model of polar-zipper mediated multimerization involving the ataxin-1 polyglutamine tract. A novel CAG repeat configuration in the SCA1 gene: implications for the molecular diagnostics of spinocerebellar ataxia type 1. 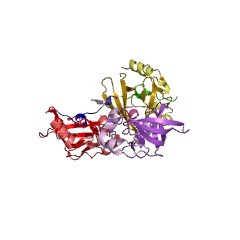 4apt The structure of the AXH domain of ataxin-1. 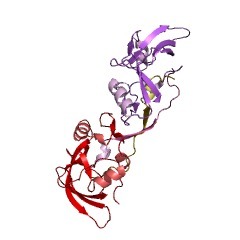 4aqp The structure of the AXH domain of ataxin-1.